This page is not about those who fanatically adore my dancing, but instead about my method of cooling a dance-heated brow. Women often bring folding cloth fans to dances, and with these flap cool air onto their glowing faces. 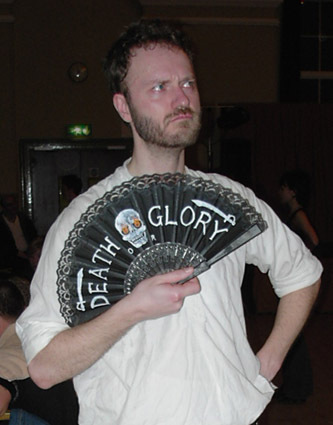 These fans, however, are commonly considered to be rather feminine in nature, and not to be used by stout chaps. a friend gave me the fan pictured, but when I received it, it was white and gold, with a rather nasty picture-map of the Costa Brava on it. I sprayed it black, and painted on a skull with flaming eye sockets, two cutlasses, and the words, "DEATH or GLORY". By this subtle method, I believe that I have created a cooling system to suit the modern man. THIS WAS SILLY. SHOW ME SOMETHING BETTER.